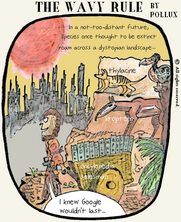 Read Ben McGrath’s fascinating article “The Dystopians” here. And yes, I get to draw a thylacine at last, which ties in with Calvin Tomkin’s profile on Walton Ford, which is here. Click on the cartoon to enlarge it! Read “The Wavy Rule” archive.